Janette Jeffrey has broken 7 World Records as a Masters Swimmer from 2015 -2016. She also holds 9 National records in freestyle and breaststroke in her age group 65-69 years. That’s just in the swimming pool. In ocean swims she was the female wInner of the Cousins Travel Open Water ‘Ocean’ swim series 2016/17 in 60-69 age group. She has won her age group of the prestigious Lorne Pier to Pub race nine times. But her picture made no front pages, and you have probably never heard of her. If young sportswomen have great difficulty getting any coverage in mainstream media, it is almost impossible for older women competing in Masters events to do so. Jan competed in the 16th FINA World Masters Swimming Championships 2015 in Kazan, Russia in August. She won 4 gold medals in the Women’s 65-69 years category for 50 metre, 100 metre and 200 metre breaststroke, as well as the 400 metre freestyle competitions. 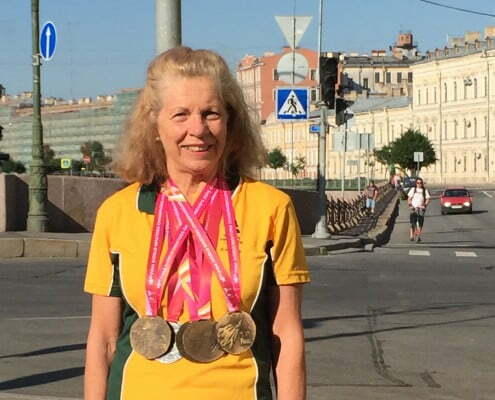 Not many people get to break their own world records, but that is exactly what Jan did in Russia. The FINA World Masters Games are the Olympics of Masters Swimming, and this makes Jan the fastest in the world by many seconds. 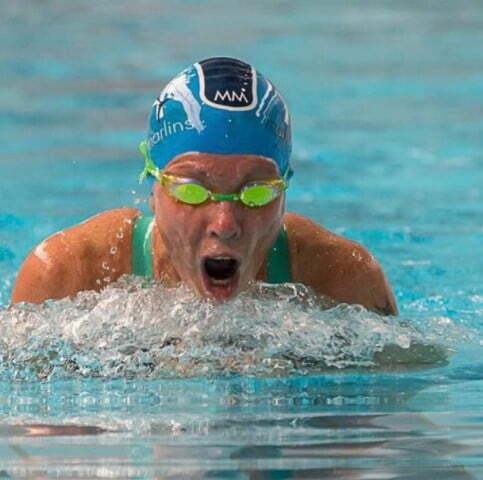 She competes against ex-Olympians who now swim Masters and she is able to beat them. “To have been able to swim the 200m breaststroke better than anyone else in the world at my age, is hard to believe”. Jan swims with the Malvern Marlins, a very enthusiastic and committed local Masters Swimming Club that trains at the Harold Holt Swim Centre in Glen Iris in Melbourne. She has been President of the Marlins and was made a life member in 2014 for her on-going contribution as a swimming coach. She joined the Marlins at the age of 43, initially just to manage her kidney disease. But she came to love not only the fitness, but also the fun and friendship she found in the group. Jan developed a drive to keep shaving the time off her laps. Her determination kept her going even when faced with life threatening illness and injuries. Extraordinarily, she achieved her 4 world record swims after undergoing a major operation on her heart. She combines her love of swimming with her love of travelling around Australia in a caravan with partner and fellow Marlin, Gerry Tucker, who is also an accomplished Masters swimmer. Jan enjoys painting the natural beauty of the places she travels through. She also finds the local “swimming geeks” and joins them in swims and competitions. Jan will be going to compete in Budapest at the Fina Masters World Swimming Championships in August this year. 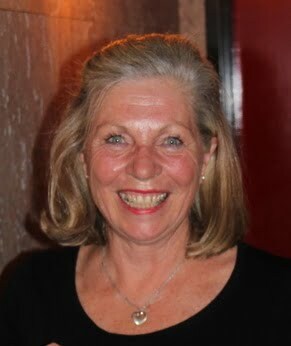 Before she retired, Jan spent many years as a teacher at Caulfield Grammar School’s Malvern Campus in Melbourne. Our favourite destination is the Sunshine Coast. It’s hard to pick my favourite place but Golden Beach, Caloundra suits us fine, and it is here where we have made a base for ourselves. The Glasshouse Mountains welcome us as we travel along the Bruce highway into town. 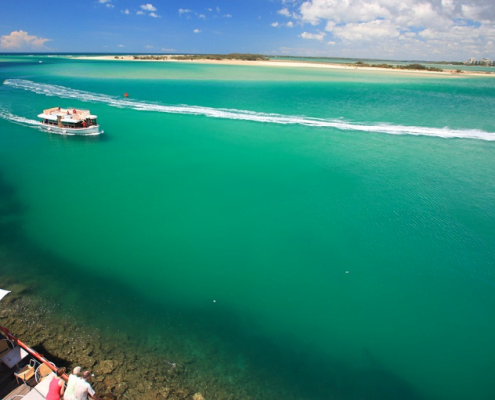 The spectacular sight of the glassy waters of the Pumicestone Passage reminds us that it is time to relax and enjoy life. Bribie Island resting in the background shelters us from the surf coast. It is truly worth getting up early to watch the sunrise in the east, and just as rewarding, the sunset at night over the Glasshouse Mountains. What a view! Kayaking over to Bribie Island with friends is a highlight of our time in Caloundra. Long walks along this pristine coastline (we are usually the only ones there), and a surf in the Pacific Ocean is a must, of course. A picnic of fresh prawns from the local fish shop, mango, avocado and salad with fresh bread of course, topped off with a glass of bubbly under the pandanus trees, usually follows our swim. Golden Beach for great bike paths that lead to all the sunny beaches. You must try stand-up paddle boarding on the Passage. Mooloolaba for shopping, coffee, and people watching, and the Mooloolaba Spit to tuck into a bucket of fresh prawns for lunch. Monteville, Maleny and Eumundi – take the time to enjoy a drive up into the hinterland for great markets, shops, art galleries and restaurants. Kings beach for a surf and swim in the salt water pool beachside. Cottontree for another pool swim, and the great Boat Shed restaurant for a sunset meal. Sunshine Beach SLSC for a hearty lunch and afternoon drinks. Alexander Headland for lazy walks on the long sandy coast line. Buderim for a great life drawing class – a must each week when I am there. A tradition for the last four years since we purchased our caravan has been to call into the township of Moree in northern NSW. Why? Because we heard that it has hot thermal pools in which to relax and undergo some serious rejuvenation therapy. It was like a scene out of film director Ron Howard’s science fiction movie “Cocoon”. 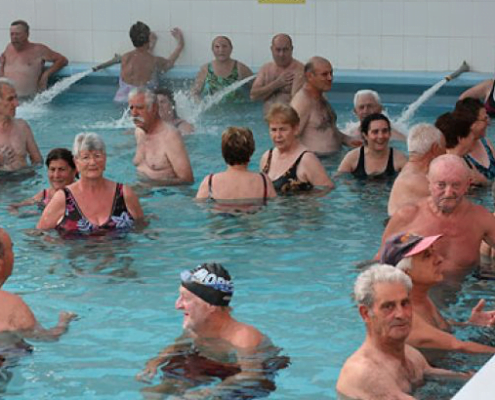 In this case, this huge pool was filled to the brim with older people wallowing in hot water, with steam rising into the damp night air. Yes, at night! They are in the pools from early morning to late at night, resting their bones and rejuvenating their souls with stories, old and new. My first conversation went like this: “Have you been around the block yet?” Translated this means “Have you caravanned right around Australia yet? ” In these waters, you don’t need a travel agent or Trip Advisor to tell you where to go, what to do, and when to do it. Everybody here over 60 appears to be computer savvy possessing mobile phones, iPads, Kindles, etc. They Skype with family all the time. No need to go home! I forgot to mention Moree has a new aquatic centre with a fantastic 50 m pool in which to do a training session. No rest for us poolies. After our workout of 3km or more, our bodies need rejuvenating! Simply go up to the high country in Merrijig, Victoria and do a mountain trail safari ride with the Man from Snowy River. My first ride of many, was for one week. What was I thinking as a novice horse rider? As it turned out it probably changed my life around. Within an hour, I was trotting and cantering through the most beautiful countryside I had ever seen. Forget the aching muscles and saddle soreness I developed in those first few days, the whole experience was worth it. The fear of sitting on top of such a large animal had disappeared, and I was in awe of the bush environment. Starting from the Merrijig area we rode through such areas as Sheepyard Flat, where I did my first ever jump over a log (it was a big log! ); along the Howqua River; Craig’s hut; Bindaree Falls; The Bluff; Mt Lovick; King Billy Tree; Hells Window; Mt Howitt; the Devils Staircase and many river crossings. Mustering cattle was another experience. Talk about moving back in time! I must tell you that the rides cater for all ages and ability levels. The rides are great for families. As darkness falls, many bush stories are told around the campfire and you can sleep in swag under the stars, if you dare. 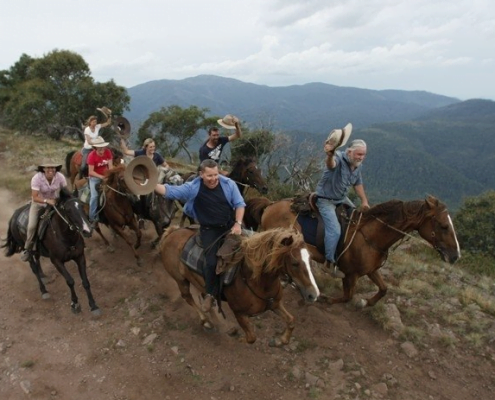 You may be lucky enough to book into a ride with the original Man from Snowy River, Tom Burlinson, who makes a regular trip back each year to reunite with the “Lovick” Cattlemen family and renew his friendships. These rides have been a life experience that I will never forget. 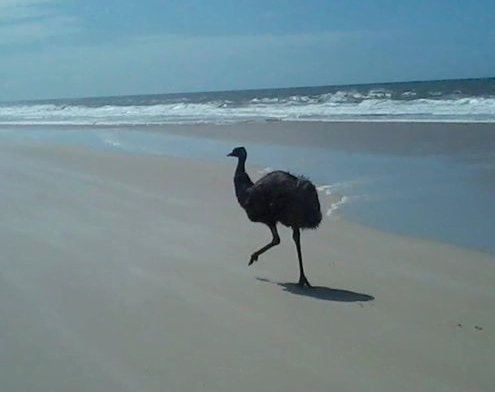 Head to Lorne between Airley’s Inlet and Wye River in summer. As you drive down the Great Ocean Road in January, you realise that summer is here. Your breath is taken away by the panoramic views and wide expanse of water as you wind around the cliff tops into Lorne. Tourists pour into this seaside town for a weekend of exciting competition. Thousands of competitors will compete in the Mountain to Surf Run, followed the next day by the iconic Pier to Pub Open Water swim. The atmosphere is electric. Some of us diehard competitors have actually been here for the week, rehearsing the swim each day. 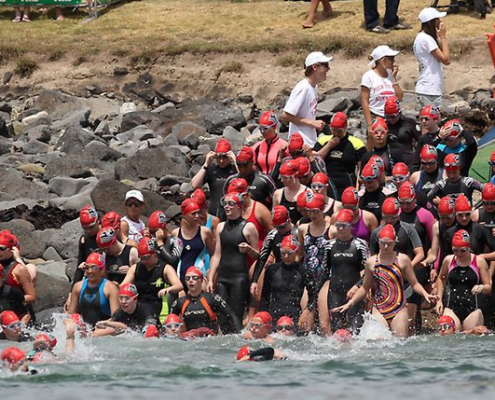 We spend the summer competing in the Cousins Travel Open Water Swim Series, and this weekend is the most prestigious swim, attracting up to 5000 swimmers. I have swum this event about twenty-two times now, and won my age group nine times. Each year it gets harder and harder to swim this event. What a challenge! People watching whilst drinking coffee. 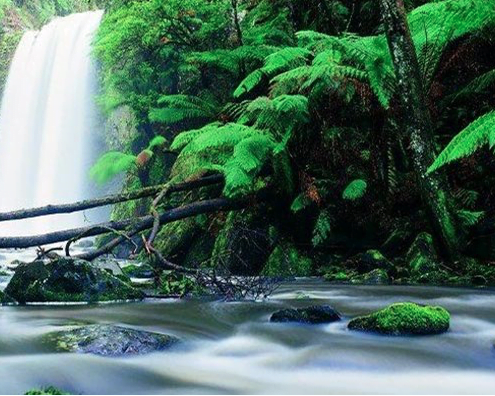 Walks in the Great Otway National Park. Lying around on the beach reading. Nippers programs for the kids. Head to the top end and visit Darwin for some unforgettable experiences. Darwin is the gateway to Kakadu, Litchfield National Parks and Katherine Gorge. We had the best experiences up here after competing in the Masters Swimming National Championships in Darwin. We swam in a chlorinated pool not a waterway! It was very scary swimming in the waterholes for us southerners, but signs deemed the area to be safe and free of crocs. I often think I need to return and re-experience the Top End again. There is so much to see. 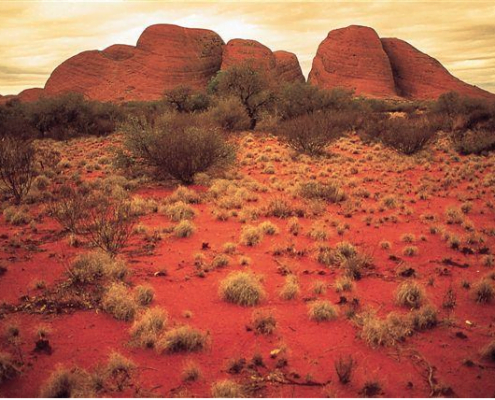 Take a tour to Alice Springs. Hear stories about the art, history, and cultures that will give you an insight into Uluru’s deep significance to the local Indigenous people. Watch the spectacular Uluru (Ayers Rock) sunset with a glass of bubbly. Kata Tjuta (The Olgas) are just as spectacular. Do a Kings Canyon tour and complete the iconic rim walk. Bed down outside and marvel at the outback sky. Travel in style on the Ghan train from Adelaide to the Top End, and in luxury, marvel at the outback. 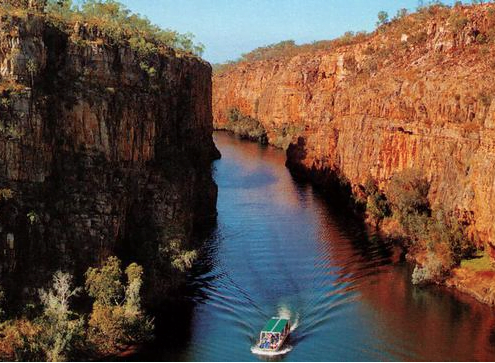 Explore Crocodile Dundee country at Kakadu National Park. Visit Mindil Beach sunset market. The Museum and Art Gallery of the Northern Territory is superb with carvings from the Tiwi Islands, bark paintings from Arnhem Land, and dot paintings from the desert. See the fantastic display of the Cyclone Tracy tragedy graphically illustrating life before and after the disaster. You can stand in a darkened room and listen to the whirring sound of Tracy at full throttle − a sound you won’t forget in a hurry. A trip to the Western MacDonnell Ranges is not to be missed and the incredible Ormiston Gorge is a must. Litchfield National Park was awesome and the waterfalls and pools were absolutely beautiful. * Travel insurance is a must. If you can’t afford it then you shouldn’t be travelling. * Scan all important documents and send to self and family back home. * Travel light. If you are moving around, no-one will notice that you have worn something again and again. * Take snacks with you. You never know when you are going to get caught out with food. * Looking forward to using citymaps2go (offline Maps and travel APP) next time I travel overseas.